My Very First Blog: Top 10 Reasons Why I Love Chinese New Year! Today is the first day of the Lunar New Year of the Metal Rabbit! Happy Chinese New Year to all my Chinese friends wherever you are! 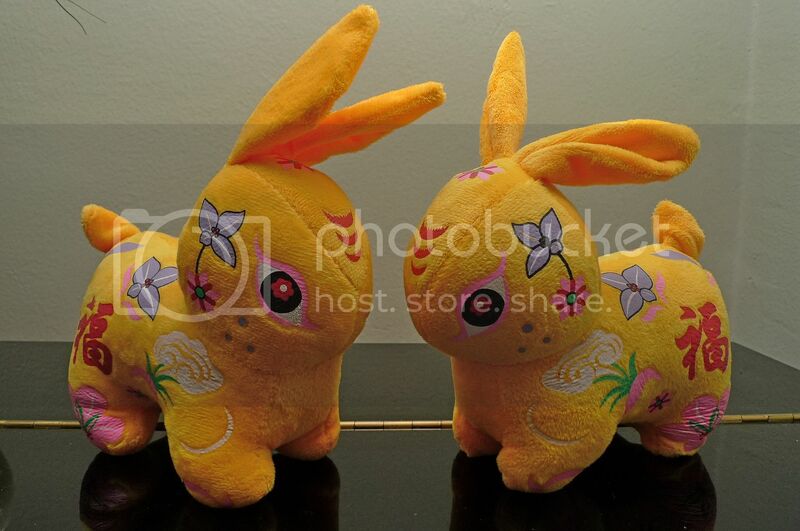 Since it's the year of the Rabbit, I got myself two pairs of cute rabbits which I bought from Petaling Street (KL's Chinatown). 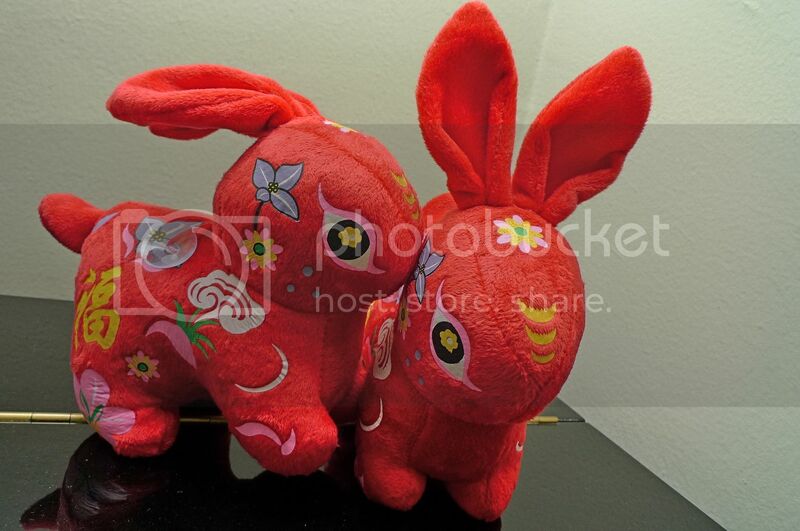 But Chinese New Year won't be the same without red colour, so I got the red rabbits too! I know what you are thinking - They are not real rabbits! But of course! Are they cute or what? Haha! So now, here are my top 10 reasons why I love Chinese New Year! 1. I can collect angpows and hopefully make enough to pay for some of my future travel expenses! 2. I can finally eat yee sang after waiting a whole year for it! 3. I have a good excuse to stuff myself silly with lots of good food! 4. I don't have to go to work! Yay!! 5. I can enjoy driving around PJ and KL since the roads are practically jam-free! 8. I can gobble up loads of mandarin oranges! 9. I can snack on arrowheads and pineapple tarts without limits! Do you love Chinese New Year too? No more ang pows from me. Well...at least not that much anymore. :p and I have to give out lots of ang pows too. Even though i dont celebrate this i still wish you a Happy Chinese New Year my friend. Obviously, I don't celebrate Chinese New Year, but I do like the reasons why you like that holiday. Yeah, it's a good thing not to work on that day especially if one works on other holidays. Happy Chinese New Year to you and my other friends that celebrate it! Having stuff animal rabbits is better than some who buy real rabbits at the whims/fancy and cast the poor fellas away when the year is over or they don't look cute anymore. Thank you very much for the fengshui updates. You have just become my FS 'master'. Have a great CNY celebration. i love CNY too!! can collect angpows! btw, do you collect all those plush toys for the 12 horoscope?? or does rabbit actually means more to you?? happy rabbit year to u n ur family!! Love to have all the peace to myself in my cave other than the crackers..
My rabbit is metal.. coincident hor?! I like angpows too hehehe. And, i like eat yee sang so much. it is so enjoyable moment. I think one of the main activities during cny is eating! No traffic at KL and PJ - You are local people. i think everyone like CNY. I wish you happy chinese new year 2011! Collect a lot of angpao too. Anyway, kong hei fatt choy! haha I love your LAST point!! NO house chores!! 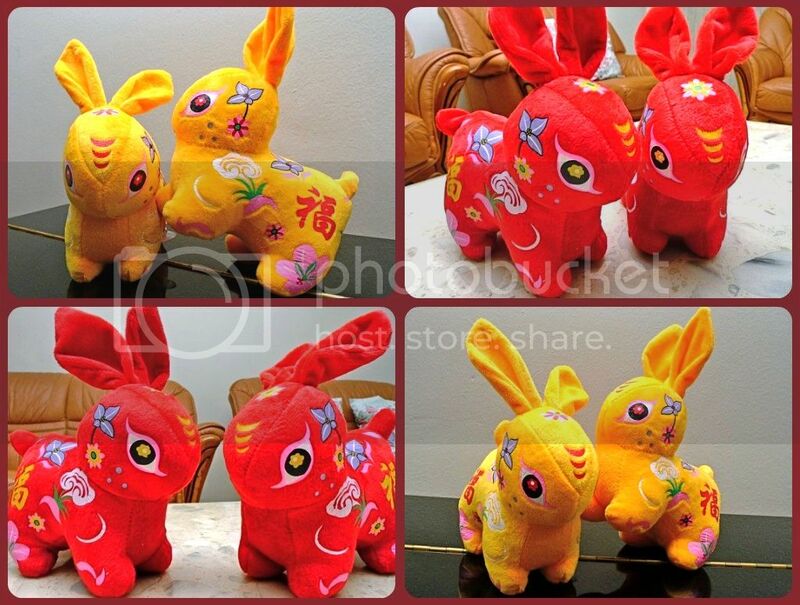 :) HAPPY BUNNY CHINESE NEW YEAR To you foong!! Happy Chinese New year to you and your family. the rabbits are adorable. Oh now that u mentioned In-Between, I am suddenly reminded of this game! Forgot how to play edi though!! Hmmm...I like Chinese New Year too because that is the best time to visit Binondo Chinatown. the rabbits r cute. i saw u on Caroline's blog. cool! Да, наверно в каждой стране найдется миллионы подобных людей. Китайский Новый год - это тоже замечательный праздник!!! I too love Chinese New Year! But this year CNY is so rush as the 1st day falls on Thursday. It would be nice if we have longer break.